One colorful agate slice strung on cotton cording and knotted to fit most comfortably. Just slide the knots to loosen the bracelet and move over your hand. 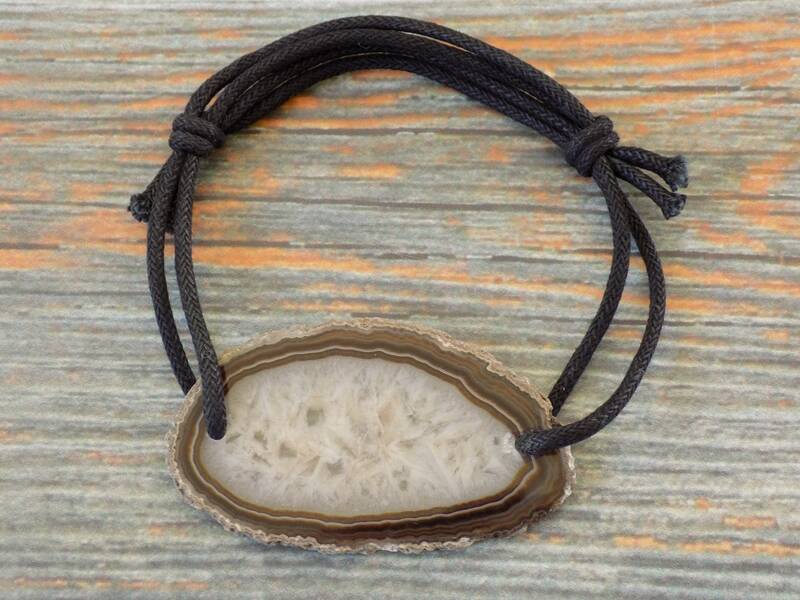 Pull knots closer to the agate to tighten and find a length that feels good for you! Agates are a natural material and have natural perfections and imperfections and can break when force is applied. Please be gentle with your agate slice. Agate offers a very gentle energy that is considered slow and steady. It connects with the energy of the Earth. Agate can bring harmony to the physical, mental, and spiritual aspects of being. Agate can be used during times of unbalance to help brings things to more of an equilibrium. While encouraging inner stability, agate helps to offer a sense of security and self confidence. It helps people to find reasoning behind the layers that may be interfering with general well being. It supports one in speaking their own truth.